Metro TAP staff say the new site should be live within the next few weeks. As many of you know, this has been a long time coming. The delay involved bringing TAP operations in house — a contractor previously oversaw that work. The video ends with “coming this summer.” Officially, summer ends in September 23 this year as that’s when the autumnal equinox begins in the northern hemisphere. That means you have six weeks from today to get this up and running. I think this will be very successful, and hopefully I can add fare as easy as I can reload my Starbucks rewards card. It will allow us (everyday, all year, lifelong riders) to be independently efficient. While granting to novice riders the time they need to fiddle with TVMs, which seem to be more difficult to people for some reason. Its frustrating to have to load your pass for the first day of the month, only to have 12 people doing the same thing, with only two TVMs, while there is a tourist family, an older woman, and the guy who (my favorite) takes 3 minutes to load his Tap Card, then walks back above because hes just loading for later in the day. What I’ve also found, and at the worst time; is if you’re not in a zone that has rail, and you need to add value (this happened to me in Culver City), it is nearly impossible to find a place to load your card, or even a driver that will know of and allow you a ride to a location where you can. So if you’re in Hawthorne with an empty tap card and a debit card only, the current system will keep ya stranded. Allow top ups of TAP cards straight from one’s own smartphone. No excuse that it can’t be done today with many smartphones having NFC capability and that the technology to do so exists elsewhere in the world. If it’s being done somewhere in the world, it can be done here, today. Allow top ups of whatever amount we want, not in set rates that Metro chooses. If I have $1.25 on my TAP card and all i want is to load up $0.50 to make it $1.75 to ride Metro, it needs to have the ability to charge $0.50 from my credit card and allow reloading just $0.50 into my balance. There’s no reason why you can’t allow us to enter in whatever amount we want. Did I miss something? What about adding value? Whenever the new TAP website is up and running, it should allow INSTANT reloads, not something that makes you wait 48 hours before you can first use it as it is today. If I load money or passes onto my TAP, I expect it to be able to ready for usage immediately, not 2 days later. I don’t have this problem with PayPal, Bluebird, Starbucks Card, reloadable VISA gift cards, prepaid fill up for cell phones, etc. I load it online, it’s ready to go. It’s as easy as that. Everyone else seems to get it. Except when it comes to TAP, it’s I load it online, oops you gotta wait 2 days before you can use it. Seriously, WTF!? Are they still using dial-up modems with servers running the very first Pentium or something? Why can’t use a debit card in exactly the same way as you would use a TAP card (here in London, it’s called Oyster) just to tap in (always) and tap out (only on rail as buses are flat-fare) at exactly the same rates as a TAP card user? The system in London always gives you the lowest fare and your journeys become free once you hit the price you would have paid for a day or weekly pass on a TAP card. So you don’t have to decide in advance for a day pass. You’ll get one automatically, once you’ve boarded enough buses or trains to have paid for one. It can even deal with the immensely complicated London fare system. For example a day/weekly pass for buses only is cheaper than the various day/weekly passes for all modes, because buses are flat-fare, whereas rail fares depend on how many zones you pass through. So, if you’re using a mixture of the two, it will not charge you a bus fare (or only charge you the amount than brings you up to the daily cap if you’re nearly there), once you hit the cost of a day bus-only pass, while continuing to charge you for rail journeys until you hit the cost of a day pass for all modes of transport for the number of zones you’ve travelled through. If you are using Oyster (which is really the equivalent of EZpass rather than TAP now that I think about it, though our fares are the same whoever is the operator of the bus or rail line), you can, of course, load up any amount you like. Online, you can even have it load up whatever amount you choose when your card goes below a certain cash level which you yourself have chosen. The technology is there for almost any combination of fares we want, if an agency is willing to adopt it. Incorrect. London Underground uses a ZONAL based system where fares change as you pass through Zones 1-6. It’s a in-between system between flat rate and distance based. That being said, if you’re Central Line and going from Greenford to Perivale, you pay the fare that your only going within Zone 4. But if you go from Perivale over to Hanger Lane, even though the distance might be the same, you end up paying more because now you’re crossing Zone 4 to Zone 3. A true distance based fare system is like the one they use in Singapore or on Hong Kong, there are no zones to cross, everything is calculated based on the kilometer traveled. But of course, you’re basing on London only as an example. I can argue that by equally stating that fares in Singapore and Hong Kong, the cheapest short trips start off as low as $0.50 as a standard fare for adults and gradually increases by the kilometer as you travel farther. As you can see, lowest fare start off at 4.5 HKD (about 58 cents) to a max of 55 HKD ($7.00) for the longest trips. I’ll leave it to others who are more familiar with other countries to provide examples that it’s possible to start off very cheap. After I had posted my reply, I was aware that I had used ‘distance-based’ too loosely. That said, zonal boundaries have been selected with distance in mind. In your example, Perivale to Hangar Lane is twice the distance of Greenford to Perivale. Also, with the exception of peak-fares into the very large zone 1, there is no one-zone fare. The lowest fare in each case always covers two zones, the next four zones and so on. I have always been amazed by Hong Kong fares. The tram (steetcar) is an amazing 30 cents (and that IS a flat-fare). Similarly, I thihk there have only been two increases in Tokyo fares in the past twenty years (I go there quite a lot) and they were both the result of sales tax rises. The operator has received no increased revenue at all. How do they do it? London residents over 60 travel pay nothing 24 hours a day on any transport mode (they have a free TAP-style card); English (but not Scottish, Welsh or Irish!) residents get free 24-hour travel on London buses (they have a national bus pass which is valid after 9.30am everywhere in the country). Children under 11 (including visitors from anywhere in the world) travel free on all modes in London provided they are with a fare-paying adult, and they can get a card (or have it programmed into their TAP-type card for the length of their visit if they are from out of London) to get half fare from 11 to 15. There isn’t a perfect system is there? Grass always greener somewhere else? Regarding currency fluctuations, it’s true that one does have to account the changes in currencies for most countries. But one can also make the interesting point that specifically for Hong Kong, the currency rate doesn’t fluctuate as much as other currencies and is “float pegged” with the USD and will always be somewhere between 7.75-7.85 HKD to the USD. That being said, if the lowest fare on the HKMTR is 4.5 HKD and the highest is 55 HKD, then the USD conversion will always be around $0.57-$0.58 at the lowest rate to $7.00-$7.10 for the highest rate. Asian transit agencies are actually corporations, they actually make profit and do not need government assistance. Did you know that in Hong Kong, their farebox recovery ratio is an astonishing 187%? Singapore has a farebox recovery ratio of 125%, Taiwan has 119%, and Japan averages 120-170% farebox recovery ratio depending on the city. What’s interesting is that they have one thing in common: they all run pure distance based fares that start off really, really, cheap. Which that being said, a zonal fare structure similar to London in Los Angeles may not be the way to go as the bus stops and train stations have been built pretty close and at almost equal distances from one another. If one were to make Zone 1 DTLA and Zone 2 Koreatown, then going between 7th/Metro to LA Union Station (approx 2 miles) will be cheaper than going from Wilshire/Vermont to 7th/Metro (also approx 2 miles) for the sake it crosses over different zones. It’s not like 2 miles between 7th/Metro and LAUS is somehow “longer” than the 2 miles between Wilshire/Vermont and 7th/Metro that warrants one to be more expensive than the other. Two miles is 2 miles. Small but important point: while 7-day travelcards in London are on a rolling basis (like in L.A.), weekly caps are based on a calendar week (Monday-Sunday). That’s because for automatic price capping you need fixed time periods. So weekly capping in L.A. would require a fare structure change. IF FIRST TAP occurs Monday August 10th at 0700 hrs, THEN week fare cap in place until Monday August 17th at 0700 hrs. And when that week’s cap is over on August 17 at 0700 hrs, it resets itself to start a new week when that person does his/her next TAP. If by chance the person doesn’t use Metro on Monday August 17 (perhaps he/she used Uber, whatever) and his/her next TAP post August 17 doesn’t happen until August 20 at 1400 hrs, then that’s where the clock time starts for his/her next weekly cap and the week cap will be in place until August 27 at 1400 hrs. Can do the same thing for 30 day passes too in lieu of monthly passes. IF FIRST TAP occurs Monday August 10th at 0700 hrs, then 30 day pass cap until Wednesday September 10th at 0700 hrs. So on and so forth. Anything is possible with some basic computer logic. 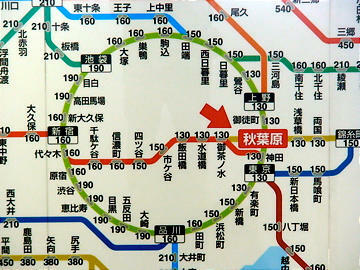 Looking at the map fare above, I can go from Akihabara to Shinjuku (approx 7.5 km or 4 miles) using the Yamanote Line or the Chuo Line for only 160 yen ($1.28) which is still cheaper than Metro. In comparison it’s also about 4 miles to go from Koreatown to DTLA and it costs me $1.75 for that short ride, where Tokyo gives it to me for $1.28. Did I mention that senior citizens and children under the age of 12 pay half that rate in Japan? What TAP needs is expansion into other markets as a true regional payments system, not just specific to transit payments. Look into how many places the EasyCard (Taiwan’s TAP card, only better) is accepted in Taiwan. Here, the only use of the money put into TAP card is to ride buses and trains. Over there, the money put into the EasyCard is accepted in places like 7-Eleven, Coca-Cola vending machines, Dominos Pizza, department stores, and even bakery shops. At least they’re saying we can rent bikes with TAP cards which is a first step in enhancing cashless payment opportunities other than transit. They should also start looking at paying for parking at Metro owned parking lots and at Union Station with TAP cards too. Why not lockers? Vending machines? Famima at Union Station? There’s so much opportunities for Metro to start collecting merchant transaction fees at a cheaper rate than VISA and the other networks charges to add to their revenue stream if they get this running and encourage merchants and retailers across the Southland to accept TAP as payment. I know you already give out information like Metro Destination Discounts where if one shows a TAP card, they get a discount. But even better is also to actually pay with the TAP card, so that way, you get to collect 1% in merchant transaction fees from vendors. And if you do it at 1%, more merchants will accept it rather than the average 3-5% rate that the major networks like VISA, MC, Discover, and AMEX charges merchants.